Valaam island is located on lake Ladoga in Karelia. Each year there arrives a lot of tourists and pilgrims not only from Russia but also from around the world. As a rule, Balaam going to look at the Spaso-Preobrazhenskiy Balaammonastery sky. But the island has other attractions – a unique and wonderful nature, very beautiful pine forest and cliffs on the shores of the lake. To get to Valaam several ways. On the island there is a pilgrimage service of the Valaammonastery of the sky, all the questions about organized tourist trips need to apply it there. Service website http://vp.valaam.ru/. Pilgrimage service of the need to coordinate also the desire to stay on the island more than one day. The most common way of getting to Valaam is a tourist trip on the boat from St. Petersburg. This method is the most expensive of all, but at the same time the most comfortable and simple. The cost varies, the specific amount can be found on the site of the pilgrimage service or at the time of booking excursions on Valaam. Rates include meals, it ship where you will allocate a separate cabin, as well as sightseeing and entertainment. Also there are cheaper tours, which cannot be accommodated in cabins and meals on Board. In most cases, the boat rides to the island at night, the day do you spend on the island, the next night back. Cruise route on Balaam may be combined with a visit to other places: the island kanevets, Svir'stroy, which is the Alexander-Svirsky monastery, are sometimes included in the tour program, and other attractions. Please check details when you book the tour. From St. Petersburg can be reached by Balaam "the Meteor". Organized trip provides departure early in the morning, stay on the island (approximately 8 hours) and the way back. The one way only takes 4 hours, but "meteor" is not such a comfortable environment. Besides, it's quite noisy method of transportation on water, so many people prefer the ship. You can get not from the Petersburg and cities of Leningrad region, located closer to Balaam, for example, Priozersk. There's the meteor, it takes about an hour. "Meteor" goes to Valaam and Sortavala. If water transport from other cities only runs in the peak season, from Sortavala running does not stop courts from may to November. The Valaam archipelago, located in the Northern part of the Ladoga Islands separated from the mainland by more than 20 km and comprises more than 50 Islands. The largest of the Islands of the archipelago - the island of Valaam. Only one environment enough to turn Balaam to a place of pilgrimage for thousands and thousands of tourists. One of the most comfortable and, as a consequence, the most costly ways - tourist cruise on the ship. The boat departs from Saint-Petersburg with arrival directly to the island of Valaam. Additionally, you will need to take care of how to get from Moscow to St. Petersburg that, in General, is not a problem - you have the Express trains, conventional trains, bus routes, departing from Moscow to Petersburg and back several times a day. The trip on the boat usually takes a night journey, a day at the island and another night on the road in the opposite direction. The fare includes cabin accommodation, meals, a number of guided tours on the island and entertainment events on the ship. Faster and more cost - effective option to journey on a water meteor (the so-called light single-deck boat) for 1 day. The administration will, as in the previous case, from St. Petersburg, here in the way you will spend 4 hours in each direction, and about 8 hours of free time for exploring the outdoors. The downside of this travel option is the noise of the boat, which for a four-hour swimming is very tiring. Another variant of arrival to Valaam tourists especially popular in the spring and autumn period, when the standard trips from St. Petersburg has been discontinued. In may or November to get to Valaam from Sortavala, where, for example, from Moscow leads the Oktyabrskaya railway. From St. Petersburg - train # 350 is sent in odd numbers of Radonezhskogo station. The train from the Northern capital goes to the village Blacksmith, then to Sortavala. Departs daily from the Finland station in 16.32 hours. To Sortovala from Moscow or St. Petersburg and can be reached by bus or car, but such a trip is tiring due to length (the distance between Saint Petersburg and city about 300 km), the car will have to leave the city for the duration of the walks Balaam. In fairness I must say that Marina is quite secure and ample Parking. From the town Wharf to the island can be reached by boat on Mondays and Fridays at 16.00 or 17.00. The journey time is 2.5 hours. You can use the local excursion ship "meteor", he goes almost every day, but without a clear schedule. Journey time 1 hour. The estimated cost of 700 rubles. In Sortavala you can use the services of the yacht club, which is located near the city's famous hotels "Piipun-Picha". From the city pier every two hours boats to Balaam, there are small carriers, most of whom work or through numerous agencies, or independently, without providing, however, tourists with special security guarantees on the water. Travel to the "Northern Athos" can be made and from the city of Priozersk of Leningrad oblast, which can be reached by train from Finlyandskogo station - direction of the Forging from the metro station "Devyatkino" or bus station "North", M. Devyatkino by bus No. 859. From Priozersk to Valaam can be reached only by boat from Valamo pier and only during the navigation season, which begins in may and ends in October. The cargo ship "Saint Nicholas" flies to the end of November, but officially does not take passengers. From monastic Republic there are specialized pilgrimage service, which organizes trips to the island. For example, to the monastery of the abode you can use them to fly in a helicopter. This one-day tour will cost about three hundred thousand rubles, two-day - 450,000. In the fresh waters of Ladoga lake is a rocky archipelago that consists of numerous groups of granite and diabase Islands. The unique beauty of the Valaam archipelago is considered to be the main attraction of Karelia. 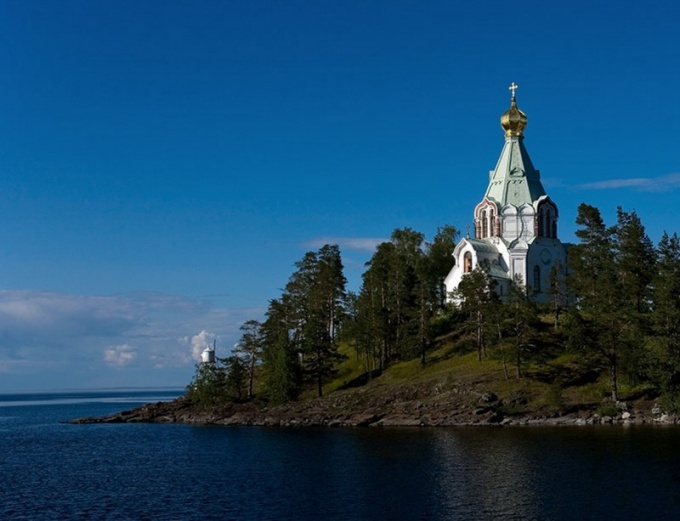 Valaam archipelago is also called "the Northern Athos". It is a monastic Empire, preserved since ancient times, life, law, hierarchy. Landscape architecture of the island blends with the pristine nature. Among the attractions of Balaam, which should certainly visit tourists, Spaso-Preobragenski monastery, where the beauty of Russian architecture is presented in the unusual combination of colors and architecture. The top colors sky blue, harmonizes with the red bottom. Completes the whole architectural composition of the three-tiered bell tower. The marble roof of the chapel was decorated with a medallion with a commemorative inscription that the Emperor Alexander II visited Valaam in 1858 On the road to the left, Spasskie gates leading to the inner buildings of the monastery. Wishing to make an optional excursion can pay a visit to the Abbot cemetery. Down to it can be passed under the arched bell tower. Interested in military history can see the remaining defensive structures of a complex. South of the Gethsemane skete is a lake. The right Bank of a Small Nikon Bay is decorated with a granite memorial cross. At the top erected the chapel of the ascension with 5 chapters. Forest path will lead to Konevsky lakes – Abbot, Ossawa, Mustajarvi. On the monastery farm, located on the shores of O. Sisterwe, here offer tourists treats. There is an opportunity to take a boat tour on the river Ladoga around the island. On the monastery grounds women must be in veil and skirt. In the White monastery (All Saints) allowed only men, except the feast of All Saints. Clean air, beauty of nature, architecture will not leave anyone indifferent. Impressions of the visit of Balaam will remain for a long time.